A few days after being promoted into my first management position I needed to hire someone, and needed some guidance. This book gave me the basic information to conduct thorough interviews and a philosophy/structure to start the process. In the intervening years, it's also served as a way to prepare to be interviewed... when I can answer the questions in this book clearly I am much more prepared and comfortable sitting on the "other side of the table." Before I read this book, 15 years ago, I thought I knew how to interview people. I was mistaken. Mr Yate described a simple process of matching resume to job, and then planning the interview skeleton to clarify specific things. It changed my mind about this critical business practice. If anyone ever gets hired again in this country, the person hiring should dust off this book first and prepare like a professional. Excellent book; very well written, and a great bank of interview questions, well structured and annotated. It's probably a good idea to flip through its pages before each job search, just to refresh possible questions in the mind. My first book on interviewing skills. Lots of insight for the in-experienced interviewer, and real world techniques I'm excited to try out. Practical tips and good philosophical food for thought for both sides of the interview table. 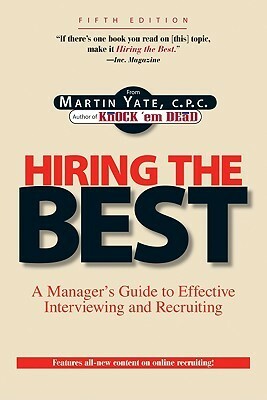 This is a great reference book for anyone doing interviewing or hiring in any size business. I highly recommend its practicality and simplicity to help in the interviewing and hiring processes. A handbook on how to hire the best employees. This was just okay. The other hiring books I've read are way better. Martin Yate - Publishes under both Martin Yate and Martin John Yate.